During the 2003 Apple Expo, I saw a titanium junior case from macway in which one can put a 2.5'' hard drive from a notebook. Last but not least, the case can receive IBM 10 G...thanks Jean! I operated..on a staircase during the Expo... but the pictures' quality was so low that I redo the operation. The only difference was that the lock key, as well as the packaging box... were left in one of the Expo trash cans ;-). 4) and the FW cable. The 4 rubber bases have already been sticked to the case during the Expo! The cover firts has to be removed. First its two lateral small screws. Then the cover itself: no grip..so carefully, insert a tool in one of the aperture and slightly pull. ... we can operate the other one. So I say it again: smoothly but firmly... without damaging the internal components by erroneously pushing on one of them as a lever. 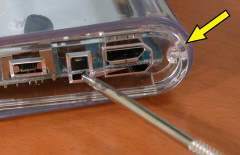 The yellow arrow points to a hole in which one could put the tool to remove the card from its support. 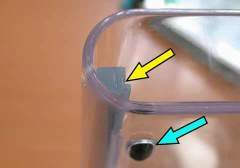 -> I would suggest the following manipulation: put the tool as on the picture and pull on the silicone sliders (blue arrow). Removing the card requiers more struggle that I thought! I understand now Anne Le Guennec's remark on powerbook-fr. -> Firmly grab the case on one hand and remove the card from the other. Be sure to pull the card in a straight aligned direction. If necessary, alternate the pulling effort between the left and right card's sliders! The card removed. 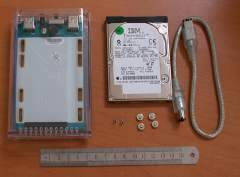 Now the hard disk is to be inserted. 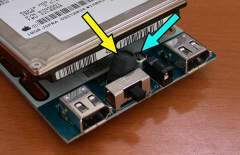 This can only be done in one direction, the hard drive fixating screws being located on the "plate" side of the card. ... and keeping connectors aligned!. It's rather meager as far as the free place is concerned! We turn back the plate to put the 4 screws. Well, clamped to its connector by the lack of place the drive is, I do not know if the screws will do anything as far as the fixating process is concerned. 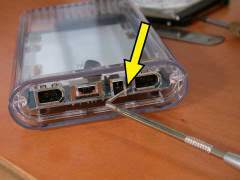 But for sure, to avoid any effort on the connectors, it is better to screw the drive onto the plate. We put back the card in its sliders (the one on the left side showed by the yellow arrow). The blue arrow points to one of the rubber bases. 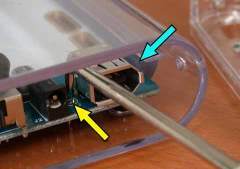 Firmly push the card to the backside of the case: straight forward movement by pushing on the plate from the left and right side (see fingers on the image)... but do not push on the FW connectors themselves! Put back now the cover: the insets do not allow any error ;-). The last two screws to lock it. 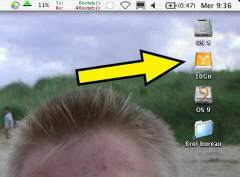 Plug the beast into the FW port of the Mac..and there is it (yellow arrow)! 3) to the extreme right: ON if powered by an external unit. 1) A multi-blades screwdriver (jump to the end of the page): not cumbersome, the blades can be easily slided to change the length of the tool. 2) A nail (used to trace out footprints for instance): the end on the right has been removed. 3) A ruler to visually show the real dimensions of some pieces.